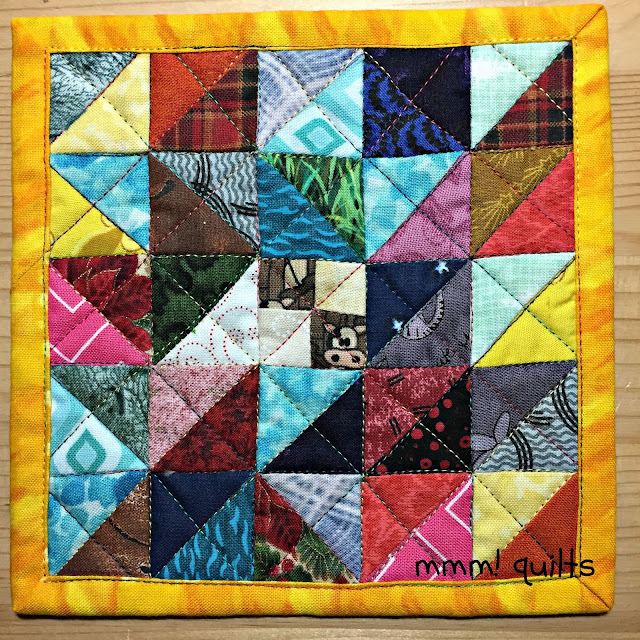 Welcome to the second linky party for those quilt projects that just reach out and GRAB you, and what do you do? You go on and let 'em because oh! 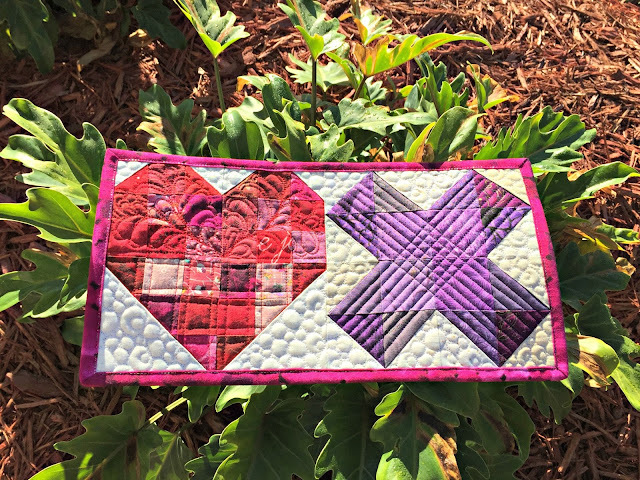 it's SUCH a knock-your-socks-off design, or oh-so-pretty, or you know just the person for whom this quilty project could be, and you have to make it for that person right now. I have had not one, but two DrEAMi! episodes this month. 😬 The first I wrote about was my mug rug I made from the HSTs cut when I joined various strips of rainbow-coloured fabric for the binding for Whirling Stars. Finding that teensie-weensie 4-patch in the centre, where each square is 1/2" finished--the cows! !--in my small scraps fabric bowl made me drop what I should have been doing and sew up this little 5 3/4" square, and then quilt it. It has a super-sweet back too, which I am using this week, and which you can read about in that post. You'd think one mug rug this month would get it out of my system, but nope, I made another, Quilt Kisses. Like I said, I have been, and I expect I always will be, bit hard by the distractions bug. "Please be advised that visiting any links provided in this linky party may result in you discovering a project you just have to make. You do not hold me, Sandra Walker, of Musings of a Menopausal Melon-mmm! 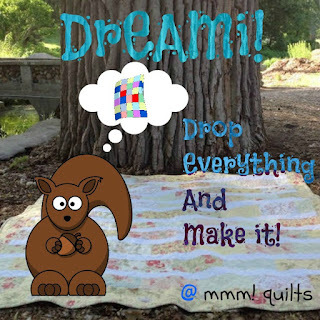 quilts, responsible for any missed deadlines, meals, or other commitments that may go by the wayside should you find yourself mesmerized by one of these quilty squirrels." It was HARD to choose just 3 shiny baubles from those 18, but I did. These bloggers' phrases ring so true for us bit-by-a-squirrel peeps. This showstopper was made by my darling enabler (cough) friend, Tish who said "I only paused for a second...... I was officially out of control." We share a love of all things Angela. Tish's fabric choices (I have those, or many of them too!!) have my eye zooming across this quilt top, mmm! 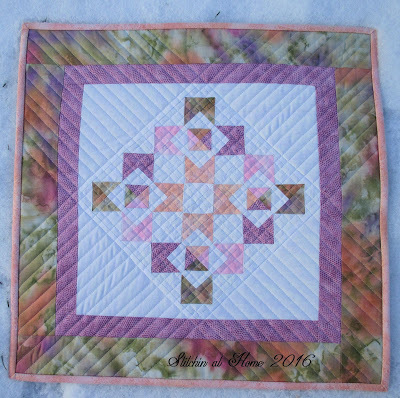 Cindy is a part of the #30quiltdesignschallenge2017 I, with Lisa of Sunlight in Winter Quilts, are hosting on Instagram (it runs until March 15, so feel free to hop in; the water's very warm!). One of Cindy's designs, her second, in fact, led to this statement, "I sewed like a madwoman!" Love the soft fabrics and the way she quilted it. Preeti's birds (she got bird flu, or bird flew) have multiplied like 30 times these 2 and then some! As she said, "Oh no, I did not stop there..." Aren't they just strutting across her design wall all sharply-dressed with a 'look at ME!' attitude? In other distractions news, I hope you've been enjoying the photos everyone at QuiltCon has been posting. Some lovely quilts, and loads of lovely peeps, many meeting up for the first time after becoming online friends through this lovely QBL of which we are all part. So what got your sudden attention this past month? You can link up any post Instagram or Flickr photo from February. Please note this is a text-only linky from now on. I didn't expect to see my squirrel in your post. Thanks! Sometimes those squirrels grab hold and don't know enough to let go...no matter how hard we try to ignore them. Okay, wish me luck - I'm about to go look at a bunch of squirrels! It's a good thing you added the disclaimer, I can see many future comments about squirrels breeding squirrels! 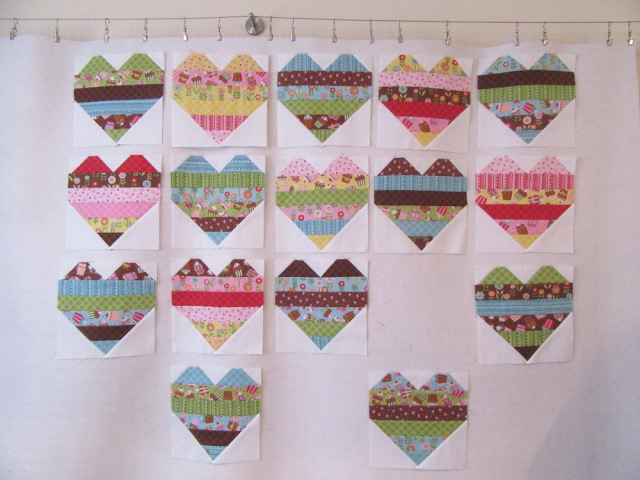 Thank you for sharing my hearts - this Linky is a great idea! It is very dangerous though - so much inspiration - but at least we all know we are not alone! Love those little mug rugs! Could someone please direct me to some instructions on how to add a button to my blog. 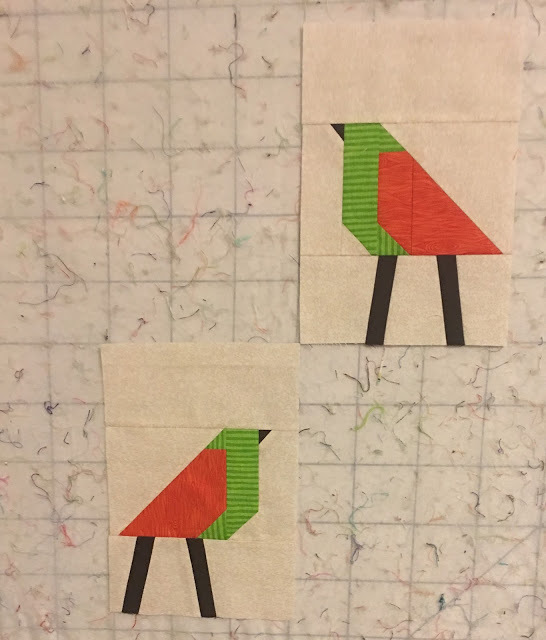 I never blogged much before but I have realized that if I want to share my projects I need to use one. Sorry, but my first DrEAMi! project is going to be knitted those kidnapping squirrels have lots of nests, hope you don't mind much. The concept is such a good one now and then. Thanks in advance for your support for this beginner. WE are totally DIY redecorating our second floor, but I get at least one day a week to play in my sewing room - a quilt for my new bed, some fleece kimona jackets for the grands, RSC piggies and birds, and a paper pieced star quilt for the day bed in the new office. Oh yeah, I have a bad case of startitis but a little work on each will get it done.